As the saying goes, retail is detail and to be successful in retail analytics, one needs to get many small things right. There is no one big simple idea in retail to guide us — marketing mix modelling comes close as a unifying analytical framework but there are still many facets that it doesn’t cover — but two high-level retail strategies can serve as anchors in how we think about retail analytics. The following diagram shows the four major steps in every retail operation. Note that 3 out of the 4 steps involve cash outflow and only the Sell step produces cash inflow. The main capital requirement of a retail operation is thus the inventory working capital, and the major difference between good retailers and poor retailers lies in how they work their inventory. There are two high-level strategies employed by successful retailers to generate returns. 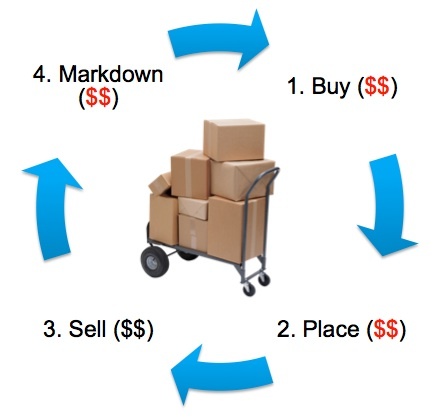 The first strategy is to cycle inventory through the buy-place-sell-(markdown) steps as fast as possible. In fact, if the turns are fast enough, a retail operation can generate cash from the inventory before having to pay for them, in which case the business stops needing working capital because the inventory are now effectively funded by the suppliers. When this happens, the business makes the transition from a low-quality capital-intensive business to a high-quality one that can generate good return-on-invested-capital. To be successful in maximising inventory turns, a retail operation would need to figure out what goods to buy/produce and where to place them to generate and satisfy demand as quickly as possible, and there is a need to strike a balance between product availability and later markdowns. This is the area where most of the actions in retail analytics happen and include well-studied topics like customer life-time values, market basket analysis, loyalty campaign design, etc. Once a good format with high inventory turns is established, the obvious next step is to try to scale by increasing the number of stores to simultaneously increase revenue and reduce average store cost by extracting operational efficiencies. This is the main leverage mechanism in retail and, consistent with the nature of a leverage, it serves to magnify profits on the way up and losses on the way down. The kind of retail analytics that are needed to support scaling include geographical demand analysis and techniques to increase brand awareness. So there you have it, two high-level strategies to anchor and organise data science activities in a retail business. 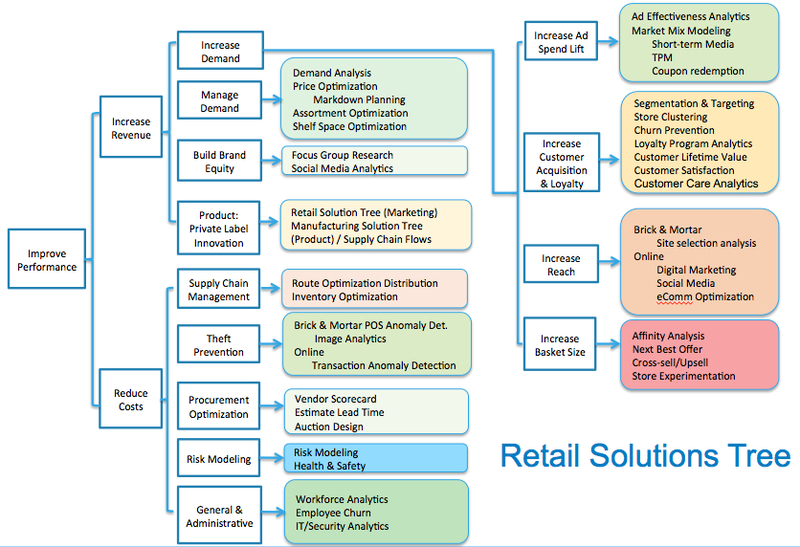 Together with a solutions tree like this one produced by my colleagues in Pivotal Software, which shows a detailed breakdown of business activities in a retail operation and associated analytical techniques that can support them, one obtains a fairly complete mental model on how to think about retail analytics. In the next post, I will talk about Big Heads and Long Tails in retail, an important topic that may provide an explanation on why a company like Tesco, a company famous for the prowess of its retail analytics division dunnhumby, is having so much difficulty from low-cost competitors.